In this tutorial you will learn how to import data in PhysioZoo. 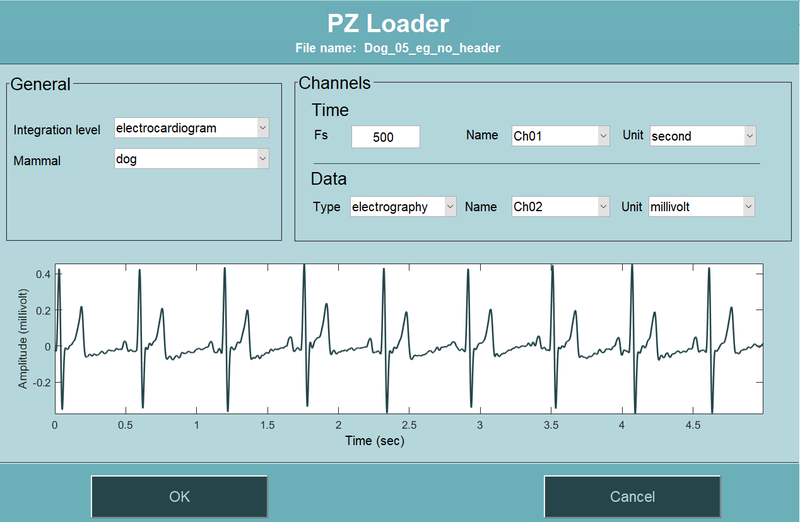 Data loading in PhysioZoo is centralized and done through the PZ Loader tool. Three types of input formats are supported by PhysioZoo - see formats supported. PZ Loader: three types of formats can be loaded in PhysioZoo. This is done through the PZ Loader. The PZ Loader will ensure that the data that enter the PZ-UI are properly formatted. Header: it is possible to include a header at the beginning of a record. This header will specify all the information that PhysioZoo needs to open a record. If all the information is specified in the header, then you will not need to go through populating the PZ Loader User Interface and the record will be directly opened in PhysioZoo. See here for the formats supported and how to create PhysioZoo headers. The figure below illustrates the pathway for loading a recording: the PZ Loader is used to load a recording from one of the supported formats. If no header is available, then the PZ Loader user interface is opened and the user is prompted to enter the necessary information. If the header is available, then the record is directly loaded in PhysioZoo. In this tutorial we will see how to make use of the PZ Loader user interface (UI) when no header is available. Download the following example file and load it in PhysioZoo. In case some information is missing from the file (e.g. mammal type is not available in the header) then the PZ Loader will request the corresponding fields to be filled by the user. When all the fields have been filled then click OK and the data will be opened in PhysioZoo.